“In an art there could be inherent characteristics of an artist that creates the work of art but creative art cannot be restricted to a nation, language, tradition or a country. We, at Janakaraliya respect ancient traditions and styles. But we do not attempt to stop the watch or turn it backward getting ourselves restricted by conservative traditions or old styles. Theatre art is considered as an arts form which incldudes all other forms of arts. Basically it’s a spectrum based performing art. It’s also a visual art. Vocal language is only a segment of theatre arts. Although it’s given some consideration in the orient, vocal language is limited to vocal gesticulation out of four gesticulations namely Vachika, Aangika, Saathvika and Ahaarya. The above statement of our leaflet is the gospel truth according to the universal theatre arts today and we do affirm it again and again with earnest responsibility. If anyone wants to ensure the correctness of this statement or to check whether it is true or false, participating at annual drama festivals in our neighbouring country at New Delhi or Tishur, Kerala is quite sufficient. In order to prove this statement further, I submit below the statement given by Dr.Kulanthai Shanmugalingam, the most accomplished Tamil dramatist in Sri Lanka today, in an interview in ‘Desathiya’ Magazine: “Tradition is our identity. We must produce our creations preserving our traditions or identities. Protecting tradition does not mean getting caged by the tradition and producing the same thing time and again. If we get totally obsessed or subservient to traditions we will get into a particular isolation. If we get ourselves locked up in our traditions we will be compelled to do stereotype creations missing out opportunities to do aesthetic and eminent works of art. While caring for our traditions we must endeavor to create distinguished works of art in par with eminent international creations. A partial diversion from tradition doesn’t mean destroying the tradition. For an example tradition is like the base or the foundation of a house. Each and every house has a foundation. But the houses built on foundations take different shapes, characters and appearances. If not all the houses will look the same. Then no one will be able to tell them apart. This dictum or theory is common in theatre arts too. We must endeavor to produce diverse creations while protecting our traditions. Professor Sarathchandra created the drama ‘Maname’ while preserving the identity of Sinhala rural drama. But it was a novel creation considered as a trend setter in Sinhala drama to date. Therefore we must be prepared to do experiments and novel creations while preserving our traditions. He, who has chosen to live among his people facing oppression and hardships during trying times rejecting offers for emigration, nourished the Tamil theatre arts under numerous hardships. Considering the sufferings he had to cope with he could have turned up as a narrow minded traditionalist. But, instead of that, he built his house on the strong foundation of Tamil traditional culture as an independent artist believing in modern universal drama practices and usages. The reason he gives for this is that ‘since Charudatta’s wife approves the love affair between Vasantha Sena and Chardatta’ it is immoral by his point of view. If, what he says is true, Tamil students in Sri Lankan universities will never be able to gain practical experience on Sanskrit dramas by producing ‘Rathnavalee’ and ‘Abhigngna Shakunthala’. Because in both dramas, considered as masterpieces universally, the main characters of the dramas love other women while having their wives. (In ‘Rathnavali’ the queen give over her sisiter to her husband, the king.) ‘Oedipus’ the universally accepted Greek drama as another work of genius will also be banned from production in Tamil as the king Oedipus of that drama cohabitate with his mother resulting birth to two children. Likewise, Tamil students and people in Sri Lanka will not be able to gain experiences from the dramas appreciate by international audiances. The ‘Mruchchakateeka’ Sanskrit drama has been used by most of the universities teaching theatre arts to produce dramas for educational requirements of the students. If Professor Rajendran, who was born in Tamilnadu, was able to produce ‘Mruchchakateeka’ to support educational requirements of National Drama School of India, (when Swami Vipulananthan has praised the drama writing the foreword for a translation of this work), why is it that the same drama cannot be produced with the participation of students of Swami Vipulananda Institute of Aesthetic Studies, a higher education institute of a University in Sri Lanka? By his comment on the Tamil language production of the drama ‘Chekku’, ‘It is the same story with the Tamil Plays produced by Janakaraliya Theatre Group. A perfect example is the Tamil version of ‘Sekkuwa’. It is a Sinhala play badly dubbed in Tamil. The performance of the Tamil version of ‘Sekkuwa’ is yet another example that substantiates my argument’, further confirms his deceitful mind set. Not only that, he rejects all Janakaraliya dramas stating that the dialogs are inappropriate. Among the Janakaraliya dramas he thus rejects are the dramas ‘Charandas’ and ‘Payanihal’. The Tamil drama ‘Charandas’ was highly praised by several distinguish Tamil artists including Kulandei Shanmugalingam and it was highly appreciated during the performances at ‘Purasei Drama Festival’, University of Pondicheri and several other locations in Tamilnadu, India. 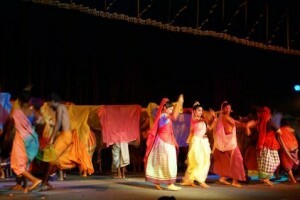 The drama ‘Payanihal’ has felicitated by Tamil scholars and audiences and represented Sri Lanka at the New Delhi International Drama Festival 2012. He is rejecting these dramas citing errors in dramatic language. We have several questions related to his statements. In several occasions many drama scripts have been translated to Tamil language from English and other languages. If that is alright what’s wrong in translating a Sinhala language script into Tamil language? What form of harm it will transpire into Tamil Theatre? Our next question is about the ‘dubbing’ he is writing about. Isn’t it possible to produce the same drama in two languages? Habeeb Thanvir has produced his drama ‘Charandas Chor’ in four languages namely Urdu, Hindi, Kannada and Bengali and performed them for the audiences talking different dialects. Charandas Chor has been produced in Assamian language also this year. According to the biographies of Badal Sarkar, he too has produced his dramas in several dialects and performed them in different parts of India . We can cite so many examples from our neighbouring country. In the international theatre arts there are numerous similar examples for this. “Phantom of the Opera, Le Miserable, Lion King, Cats etc” have been translated and produced in Japanese, German, Italian, Dutch, French, Spanish and South African languages using performers from those countries using the overall design of the original English version. Is Mr.Jayasankar referring to this practice as ‘dubbing’? If the above examples are taken into consideration, can he declare outright that we don’t have the right to create our drama ‘Sekkuwa’ in Tamil language to perform it for the Tamil brethren of our country? Is it a crime to produce the ‘Sekkuwa’ in Tamil language using ‘Kolam’ and ‘Sokari’ traditions of the South? Another important fact has to be mentioned here. We have not only produced Tamil language versions of Sinhala dramas. We have translated Tamil dramas too into Sinhala language and produced them according to Tamil drama traditions in Sinhala language using both Sinhala and Tamil dramatists as actors. For examples we can cite the production of Dr. Kulanthei Shanmugalingam’s ‘Enthayum Thaham’ and performing it at the ‘Namel-Malini Punchi Theatre’ in Colombo in 2010 and producing a Buddhist Jathaka story in Kaman Kooththu style under the title ‘Thaham’ and performing it in many places. The Tamil language translation of Bertolt Brecht’s ‘Caucasian Chalk Circle’ by Dr.Kulandei Shanmugalingam will be produced by us as a co-production with Professor Mounaguru using both Sinhala and Tamil actors. This is what Mr.Shivagnam Jayashankar said about the Tamil language version, created in the same design and pattern, ‘Mruchchakateeham’ of the same drama “The play simply looks like a commodified South Indian Tamil Film. The dance and music sequences of the play added to this impression.” What is this disparity? What is the reason for a board of judges consisting of University lecturers and scholars with profound knowledge on theatre arts to appreciate the quality of Sinhala version and another scholar of the same catgory condemn the Tamil version of it? We have paid special attention to study how singing and dancing were inculcated into the Indian Cinema. From the earliest Films of Thamilnadu such as “Draupadhi Vastrapaharnam”, “Lava Kusa”, “Mihi Ravana”, produced by the pioneers of South Indian Cinema during 1916 – 20, S. M. Dharmalingam Mudaliyar and Nadaraja Mudaliyar, the Tamilnadu cinema was influenced by theatre arts. This is a special and common feature of the Indian Cinema. The Indian cinema was dramatized and enriched by addition oriental usage of dancing, singing and music and “Navanalu Rasa” superseding the naturalism of the western cinema. While the Tamilnadu cinema developed absorbing the features of theatre arts the development of theatre arts diminished. But forceful traditional drama styles still prevail. Moreover, today in Tamilnadu, the artists engaged in Modern Theatre practices are compelled to engage in a continuous struggle with the cinema. Today Tamilnadu is a paradise of cinema fans. Cinema has become so influential the audiences tend to watch the dramas now through a cinema point of view. Sri Lankan Tamil society is also influence by the same issue. We have met judge board members of Tamil dramas of our country with the view that songs or dances should only be for cinema and not for dramas. We were amazed by a comment made by a lecturer of a fine art subject of the Eastern University participating at a discussion with the students after the performance of the premier of ‘Mruchchakateeham’. This is what he uttered in his own words in front of us and students, Professor Mauíguru and Mr.Niriella without any hesitation; ‘In that drama the actors and actresses make facial expressions just like in close-ups of films these are done only in films’ Mr.Jayashankar too is seeing the dramas through a cinema eye and cinema mentality. If Mr.Jayashankar has watched the drama ‘Mruchchakateeham’ created by the veteran drama and theatre teacher Professor K. S. Rajendran of National Drama School , New Delhi India , in 2007 with the participation of his students, he would have claimed it as a copy of a film. It was a ‘Mruchchakateeham’ drama production so rich in dancing, singing and music and also with spectacular scenes. Similarly he would have seeing a film in Professor Sarathchandra’s ‘Mahasara’ or ‘Vessanthara’ and Lucian Bulathisinhala’s ‘Tharawo Igilethi’. Numerous international drama productions could be cited in which he will see cinema. The Great Russian filmmaker Sergei Eisenstein developed the ‘montage theory’ of cinema adapting drama principles. The technics of Kabuki dramas where a totally different signal is emitted from a collection of several other different signals emitted simultaneously was cited by him as ‘Monism of Ensemble’. It is amazing about Mr.Jayasankar’s knowledge of not only of the cinema but the technical aspects of dramas too. It is sad about his negligence to see or ascertain the numerous dramatic technical aspects and manures in “Mrichchakateeham”. Today, working only with traditions of a country is not adequate for the development of any form of arts including theatre arts. All forms of arts get nourished through integration with different traditions, styles and civilizations and also through mutual influence. Mr.Jayashankar sees this as ‘a mission of multinational corporations’. He vehemently rejects the above phenomenon and clings only to his traditions and attempts to fence or ‘cage in’ the future generation too. He is attempting to limit all creative activities of the Tamil theatre arts within a narrow frame of style and tradition while condemning and denouncing anyone not caught in his constricted frame daring to break out. This is a regulatory police work. And also it is a kind of a sensorship too launched by Mr.Jayasankar. Yes, we hope to publish the Tamil script of “Mrichchakateeham” with production notes and details of both Sinhala and Tamil versions including the dialogue going on about it in media and internet. The elephant in the room here is again TAMIL HINDU RACISM/EXTREMISM. Let’s call it for what it is. The authors so far have been dancing around this issue instead of pointing out the culprit. There is a section of Sri Lankan Tamil Hindus who are higly racist, caste oriented, misogynistic, and very, very insular and this attitude had been promoted by the LTTE and Tamil politicians for their own survival. These charlatans believe that they are the “protectors of Tamil Hindu culture” (whatever that means). They find it disgusting and repulsive if there has been any involvement of the Sinhalese/non-Tamils in their so-called “pure culture” and they find any sort of liberalism and inter-ethnic co-operation reprehensible. The same people were moaning when Tamil Christian children learnt Bharatanatyam claiming it is a Tamil Hindu tradition; it must be anathema for them to see Sinhalese and Tamils working together! I wonder whether this is a carry on from the pernicious Tamil Hindu caste system which views others who are “lower” as vermin? What would Kadavul think of this? Do you think he would approve of this bigotry being displayed so openly and brazenly? Spending thousands of rupees for poojas and donating gold necklaces to the local Kovil will not wipe out the hatred in one’s heart. Let the Sinhalese and the Tamil artists work together, wipe out division and live together like brothers and sisters! Not THAT would be a tribute to Tamil culture! Comparing the relationship of Charudhata and Vasanthasena of Mirchchakadikam with Oedipus and Jocasta of King Oedipus shows the vulnerability in understanding drama literature and this was the problem with Tamil Mirchchakadikam itself. Instead of exploring the problem in the text and made the play relevant to current context the respondents try to create a different picture and divert the debate. But that also made them expose. I wish to quote A.Mangai’s comment at this juncture in order to get the point clear. QUESTIONS RAISED BY VASUKI HAVE TO BE ADDRESSED IN DEPTH. DO WE HAVE ALTERNATE IMAGININGS OF A FEMALE EXISTENCE? HAVE WE PRODUCED IMAGES THAT CAN HELP US BREAK THESE STEREOTYPES? I THINK ANY TEXT CAN BE READ IN CONTEMPORARY WAYS ON STAGE / READING. ALL THAT WE NEED IS OUR PERSPECTIVE AND IDEOLOGY. HABIB TANVIR’S PRODUCTION OF MRCCHAGATIKA IN INDIA HAS BROKEN NEW GROUNDS. Especially with so many women learning thetare for higher studies in tamil, in srilanka, which is undreamt of in tamilnadu, I wish we can have more path breaking texts, performances and directions! (1) As I understood Mr.Rasaiah didn’t try to compare Charudaththa and Vasnathasena with Jocasta and King Oedipus. The point he raised was whether anybody could do productions of Rathnavali, Abhignana Sakunthalam Sanskrit plays or Oedipus, the Greek play in Tami. Without replying to that Mr.Jayasankar is telling other thing. (2) He is repeating same silly feminist issues rose in his first letter though Dr. Sunil Wijesiriwardena and Mr.Parakrama already have responded to them very clearly. (3) Now Mr.Jayasankar is trying to hang up with Mangai’s comment on Vasuki’s(His wife’s) review in Tamil which was published once in Thinakkural newspaper too. I have read it. Please Mr.Jayasankar, could you translate it in to English and publish in these websites. Then everybody will be able to get to know “how silly and childish” article was that filled with rubbish ideas on theatre and about her knowledge on theatre and cinema. Dear Dr.Sunil Wijesiriwadena, Mr.Parakrama and Mr.Rasaiah – Please stop this debate with these people. The best thing is continuing with your creative work without wasting your time for these kinds of silly debates. Mr.Parakrama and Prof.Maunaguru, please do that Tamil production of Bertolt Brecht’s “Chalk Circle” in Batticaloa. Mr.Jayasankar, please continue your work with your Great Tamil traditions. If you all have time or will, all of you try to work together. Share your experiences without keeping hidden agendas. You all are assets to Sri Lanka. Please stop this. These kinds of debates will last with sad endings. I am sure you all need FREEDOM TO CREATE!